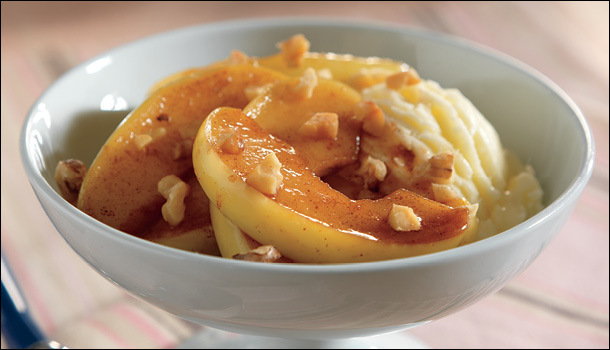 Cut apples into quarters; remove cores and cut into 1/2-ince-thick slices. Melt butter in large skillet over medium heat. Add apples; cook 4 minutes, stirring occasionally. Combine apple juice, brown sugar and cinnamon; pour over apples. Simmer 5 minutes or until apples are tender and sauce thickens. Transfer to serving bowls; serve with ice cream, if desired. Sprinkle with walnuts.